Tab is common and popular system like Web browser. But Office does not use tabs. So the users can not see at a glance all the documents they're working on and it's not easy to switch between them. 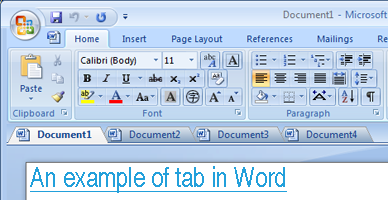 Office Tab will solves the problem by putting tabs on Word, Excel and PowerPoint. OfficeTab is an Office add-in designed for Microsoft Word, PowerPoint and Excel which will bring the tabbed browsing editing and managing into user interfaces. With Office Tab user can easily open multiple documents to be contained within a single window, using tab for switching sets of documents.